This is a healthy male in early 40s who presented to his dermatologist with a few months of consistent and enlarging skin lesion. A shave biopsy showed it to be basal cell carcinoma. A 3 mm lesion visible turned into a 5 mm hole after clearance of tumor. Patient was then referred for closure of this wound. 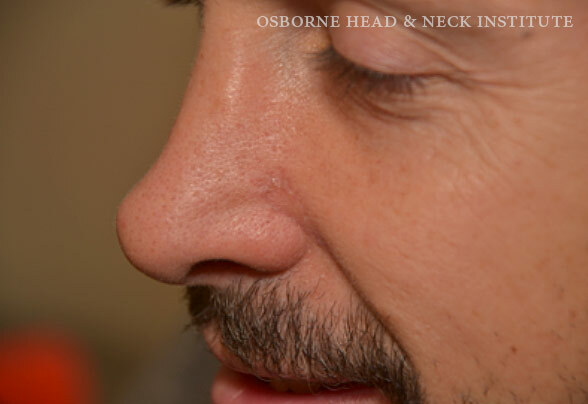 This area of the nose is very visible to the eye and thus closure needs meticulous re-approximation of the tissues as well as careful planning of the flaps used for closure. In him an advancement flap was utilized to close the defect. The incision lines were hidden within the natural creases of the cheek and the smile lines. 3 months after reconstruction the wound has healed nicely with little to no scarring. This is a healthy professional female in her 50s who noted a growing lesion on the left side of the nostril. This was biopsied and shown to be basal cell carcinoma. She underwent surgical excision of this lesion via Mohs surgery. Once this small 4 mm lesion was excised the defect was greater than 1 cm. She was then referred for closure of this defect. Reconstruction of nasal ala is challenging because most flaps would result in the change of the shape of the nostril and nose in general. Oftentimes, this change can be accompanied with difficulty breathing through the nose. In her case a local rotational flap was used to close the defect. This flap allowed for minimal pulling of the ala and was able to completely close the defect. Furthermore, she continued to be able to breath from her nose. Patient is a young male with a diagnosis of a small basal cell carcinoma of the tip of the nose. The small 0.5 cm mass was excised and a larger 1.1 cm defect was created after Mohs surgical excision. He was then referred for closure of this defect. The skin cancers of the tip of the nose pose a cosmetic challenge. 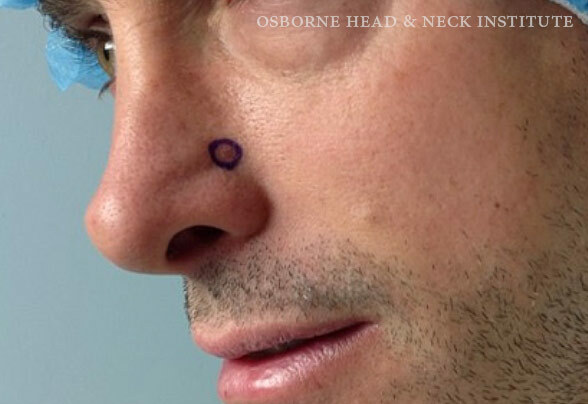 The prominence of the tip of the nose makes most scars visible. The distance from surrounding structures limits the options available for closure. In most instances surgeons will attempt to close these with larger flaps either taken from the forehead or the side of the face. These flaps have a long down time and require further surgery to achieve appropriate cosmetic outcome. In this case a smaller rotational flap was used to close the defect with little noticeable scar and great cosmetic outcome. Patient is a 72 year old female with a very aggressive and large squamous cell carcinoma of the nasal sidewall and medial cheek. This aggressive tumor has eroded through the nasal sidewall and surgical excision required removal of the entire tissue down to the nasal bone as well as the nasal mucosa. The resulting defect was a large hole connecting the inside of the nose with the outside. Her reconstruction included several flaps to reconstruct both the inside lining and the skin defect as well as reconstruction of the nasal cartilages that were removed during the excision of the cancer. In order to do this cartilage was borrowed from her ear and transferred to the new nasal sidewall. After surgery she was able to have full function of her nose and had great cosmetic outcome. This is an elderly gentleman in his 70s who had a lesion of the lower lip that continued to grow. Initial biopsy was consistent with atypical skin cancer. Patient underwent wedge resection of this lesion with clearance of the arteriovenous malformation. This was then reconstructed with approximation of inner mucosal lining followed by approximation of the lip muscle and then approximation of the skin. This multi-layered cosmetic closure allows for excellent cosmetic outcome. Skin cancers of the lip pose a unique challenge. Besides cosmetic considerations, the lip is a functional structure that aids in speech and eating. This makes appropriate reconstruction of the lip extremely important to quality of life. Patient is a young female in her early 50s who was diagnosed with a small basal cell carcinoma of the nasal tip. After undergoing Mohs surgical excision, a defect of the nasal tip was created. Patient was then referred for closure of the defect. This was achieved using a local rotational flap utilizing the skin from the surrounding structures. The closure left very little scarring that is not easily noticeable. The defects of the nasal tip pose special challenges because of the prominence of the tip. Most scars in these areas are easily noticeable and hard to conceal. Adequate planning, proper surgical technique and proper postoperative care are essential to achieving great results. Patient is a female in her 50s who has had prior history of skin cancer. She noted a growing lesion along her right ear. This was a small lesion measuring less than 0.4 cm. Biopsy confirmed basal cell carcinoma and she underwent Mohs surgical excision. The defect was significantly larger than the visible lesion and patient was referred for reconstruction. In this case a facelift incision was used to close the defect with scars appropriately hidden in the wrinkle lines around the ear. 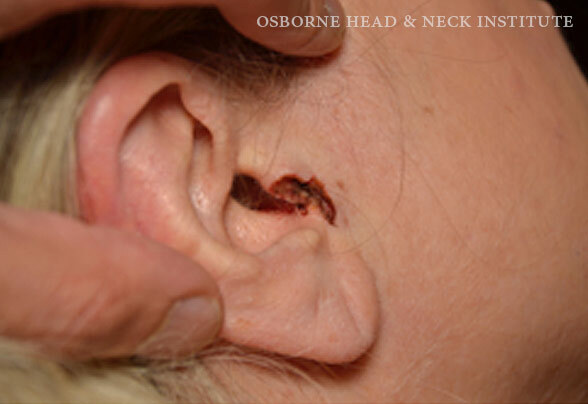 Skin cancers of the ear are often overlooked, as this area is not readily visible to patients. However reconstruction in this area can be challenging, as the surrounding skin is tight with limited ability to advance for closure of large defects. Patient is 40-year-old female who noted an enlarging lesion of the right nasal dorsum. A biopsy was consistent with basal cell carcinoma. 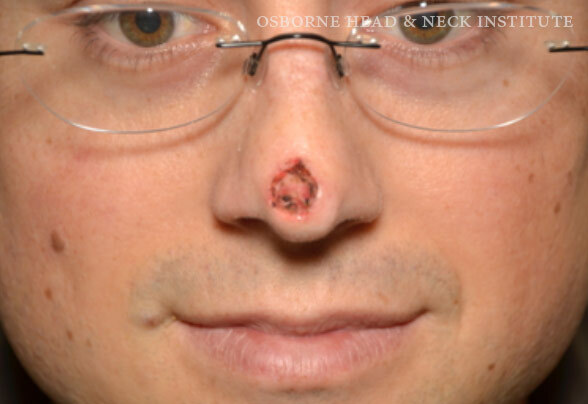 She underwent Mohs surgical excision with a resulting 5 mm by 5 mm defect of the nasal dorsum. She was referred for closure of this defect. In her case a simple multilayered, cosmetic closure of the wound was sufficient to result in a nicely healed scar that is not easily noticeable. Because of its prominence, the nose is readily exposed to sunlight and the elements. This makes it both more likely to develop skin cancer on the nose and less likely to have a cosmetically appealing scar once reconstruction has been done. This is where proper planning and appropriate surgical technique can lead to excellent cosmetic outcome.